Easy Ways to Trick out your gym with customized sporting goods. There are a ton of great customized sporting goods for your team out there. 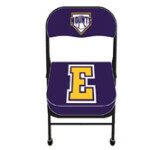 Locker room stools, sideline chairs, sideline tarps, customized ball carts and all sorts of uniforms and apparel. There’s nothing more professional looking or moral boosting that having your team logo on everything you can think of. The problem is we often think of it a few days before the season starts and customized product usually has a lead time of 2 or more weeks. So order it now! Yep it’s a low tech solution to a first world problem. Make sure you put your orders in a few weeks prior to season and then you can start your season off on the right foot with a few less things to worry about and all the team gear you need. Locker Room Custom Stools are compact and comfortable. Custom Stools are perfect for the locker room. Padded seat top features a durable vinyl cover. Custom stools frame is made of steel for long lasting value. Fold for compact for easy storage. 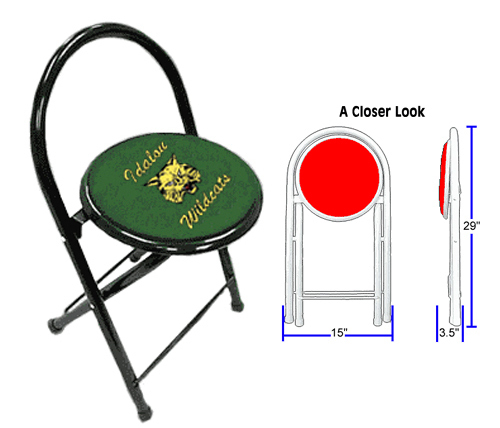 Printed price includes a free 1 color imprint on the custom stool seat top. Available in all 11 frame color and 9 vinyl colors. This Deluxe Custom Sideline Chair is a high quality sideline chair featuring a more stable frame design. The feet on this frame allow more contact with the floor for stability. The frames are super duty with a powder coated finish for longevity. Available with or without custom printing. Durable 3″ vinyl coated cushion seat for comfort and durability. These super duty sideline chairs support up to 450 lbs. With these Custom Mascot Ball Racks you get to pick your school colors, school mascot and school name. We will paint the rack in your favorite school color and imprint our stock mascot head and your school name or initials in tough vinyl graphic lettering in your second school color. (if you prefer to use your custom logo, please furnish a black and white original copy to scan. Space allowed for imprint is 7.5″ x 7.5″. 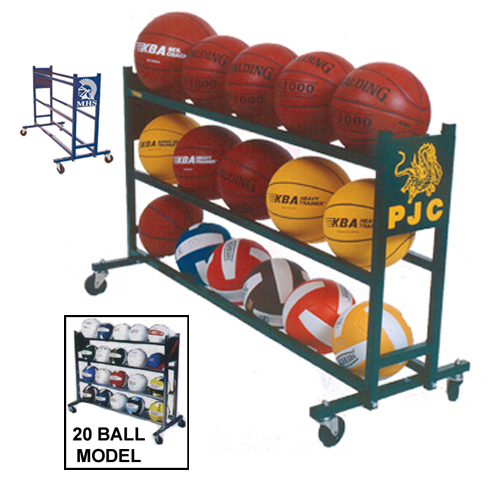 B-ball racks are made of 16 gauge steel tubing. The entire body of the rack is all welded…no assembly. The wheels are heavy duty 3″ swivel casters that are non marring to your gym floor. Wheels come assembled to the axles but must be bolted to the rack with four bolts and lock nuts. This rack will not shake apart. Will last for years!!! Two models available. The M11507 will hold 15 basketballs, 18 volleyballs or 18 soccer balls. Size is 51-3/4″ length, 20.5″ width, 29″ tall. The M24079 will hold 20 basketballs, 24 volleyballs or 24 soccer balls. Size is 51-3/4″ length, 20.5″ width, 42″ tall. Check out MorleyAthletic.com for all these items and more.